Salar de Uyuni is one of South America’s most phenomenal attractions. The vast expanse of white, glistening salt stretches across 10,582 kilometers of the Altiplano and can even be seen from space. Layers of salt are sandwiched between sedimentary deposits that reach a great depth of 10m in the centre of the flat. In total there is an estimated 10 billion tonnes of salt here. However, the real treasure for the locals lies beneath the salt flat, where approximately 70% of the world’s lithium reserves can be found. An entire industry has been devoted to the extraction of this light metal which is responsible for powering laptops, smartphones, and electric cars. An array of jaw-dropping sites surround this marvelous landscape to produce one of the most extraordinary and unforgettable tours you will ever experience. This magical corner of the world is complete with vibrant colored lakes, bubbling geysers, crazy rock formations and quinoa producing villages. Although it attracts many visitors, it remains one of the world’s most unspoilt and natural landscapes. On a still day, a thin layer of water covering the salt transforms the salt flat into ‘The World’s Largest Mirror’ reflecting the sky. This marvellous reflection of the sky is most likely to be seen during the rainy season (December to April). Those who are lucky enough to experience this natural wonder will tell you how difficult it is to distinguish where the sky ends and land begins. Excluding the cacti-filled islands, ‘Isla Incahuasi’ and ‘Isla del Pescado’, the landscape is completely flat which creates an endless horizon that is optimal for all sorts of crazy perspective photos. From the remarkable mirror effect and perspective photos to the numerous natural wonders surrounding the landscape, it is no wonder that this part of the world is regarded as a paradise for photographers. Some 40,000 years ago the enormous Salar de Uyuni was covered by Lake Minchin. Water from the surrounding mountains gathered here because there was no drainage outlets in the Altiplano. This lake later transformed into Paleo Lake Tauca and many other smaller prehistoric lakes. A rise in temperatures coupled with a change in climate from wet to dry caused the water to slowly evaporate. As this water evaporated, high salinity levels caused a thick salt crust to form, leaving behind the impressive salt flat that we see today. Water underneath the salt flat continues to evaporate under the heat of the sun, leaving behind more salt on the surface. 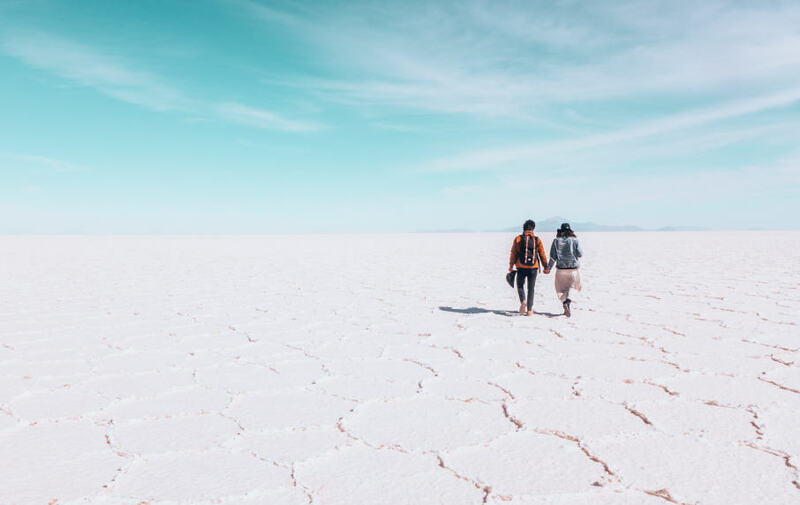 The rate of evaporation is ten times more than precipitation, meaning that Salar de Uyuni is a never ending salt source! If you were to ask the campesinos (Spanish for ‘peasant farmers’) living on the lake’s shores, they will give you a rather different explanation on how the salt flat was formed. 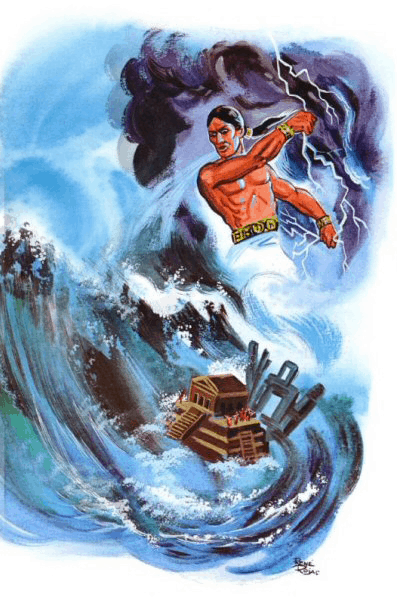 Legend has it that the mountains surrounding the salt flat were once giant people and that the mountain goddess Yana Pollera (the nearest peak to the salt flat) was involved with both Thunupa and Q’osqo. When Yana Pollera became pregnant, the two male volcanoes fought tirelessly and tenaciously over who the father was. She sent her baby far away to protect its safety but immediately became worried that it wouldn’t survive alone. In an attempt to care for her baby, she flooded the plain between them with her milk so it could be fed. The milk eventually turned to salt, leaving behind the miraculous Salar de Uyuni. Alternatively, Aymaran legend tells another obscure story about the formation of Salar de Uyuni. Again, this story believes that the mountains were once people and that Tunupa and Kusku were married. After Kusku deserted his wife for Kusina, Tunupa was left heartbroken and her tears are said to have formed the salt flats. 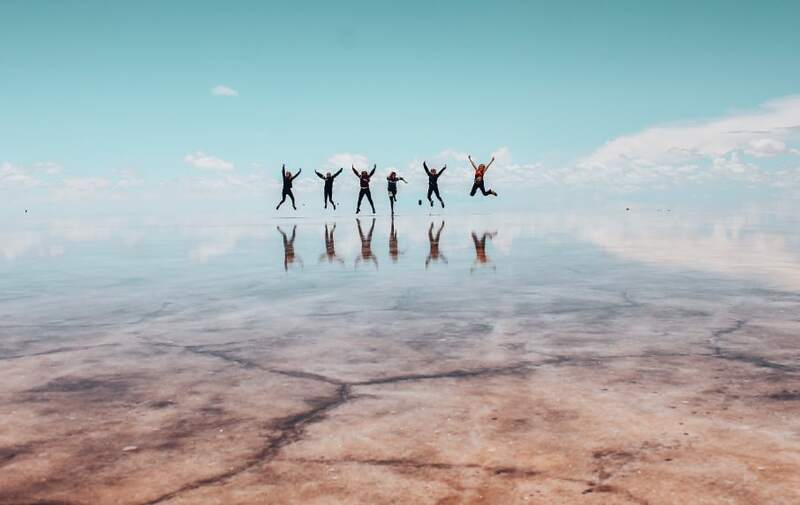 Salar de Uyuni offers an unforgettable experience at any time of year. The landscape can completely vary depending on the season, meaning that the best time to go ultimately depends on the experience you’re looking for. Many people visit Salar de Uyuni in the hope of seeing the mirror effect. For an increased chance of seeing this, you should visit between March and April. Unfortunately, the salar has a tendency to flood during the rainy season, causing some parts of it such as Isla Incahuasi to become inaccessible. However, for the best climate and unrestricted access to all of the sights, you should visit between July and October. Salar de Uyuni is located in the Daniel Campos Province in Potosí in southwest Bolivia. This spectacular landscape lies at an elevation of 3,656 metres above sea level, near the crest of the Andes. This means that altitude sickness can play a decisive factor in whether you enjoy your time here or not. In order to avoid this, it is advisable to spend a couple of days gradually adapting at heights of around 1000m and 2000m. Local advice to relieve the symptoms of altitude is to chew on coca leaves. Finally, those who haven’t had a chance to acclimatize should pick up some Acetazolamide from the local pharmacy in Uyuni. Despite being in quite an isolated location it can be easily accessed. The most common ways to get to Salar de Uyuni are via La Paz in Bolivia or San Pedro de Atacama in Chile. 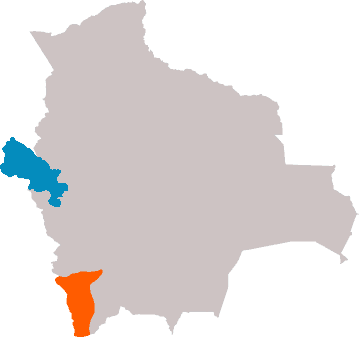 However, it can also be accessed via other parts of Bolivia and Chile as well as Peru and Argentina. 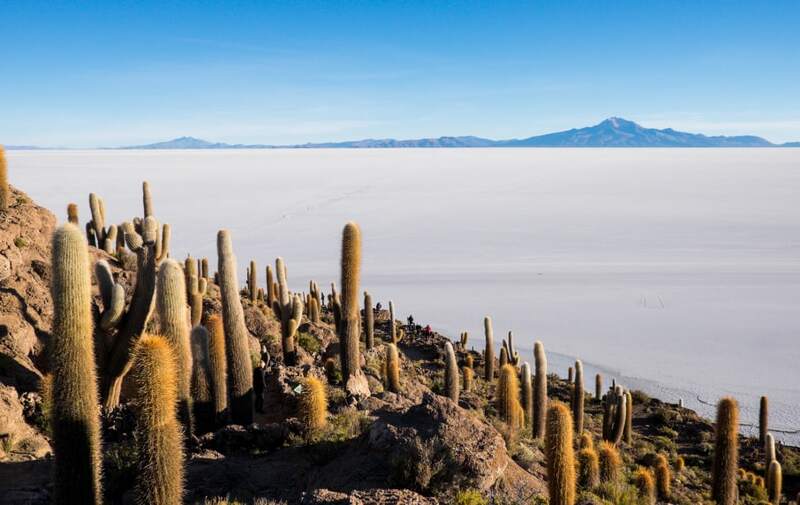 For more information on how to get to Salar de Uyuni click here. The best way to see this incredible vista is by taking a three or four day 4×4 tour across the salt flats. Those who visit have the option to do a one day, three day or four day tour depending on your prefered length of exploring and where you want your tour to start and finish from. It is recommended to bring warm clothes and a warm sleeping bag if your tour is over one day long as these tours involve a night’s stay in very basic accommodation. Despite the warm weather and blistering sunshine during the day, this part of the world is very cold at night with temperatures often falling well below freezing and sometimes even as low as -15 C. For more information on tours of Salar de Uyuni click here. 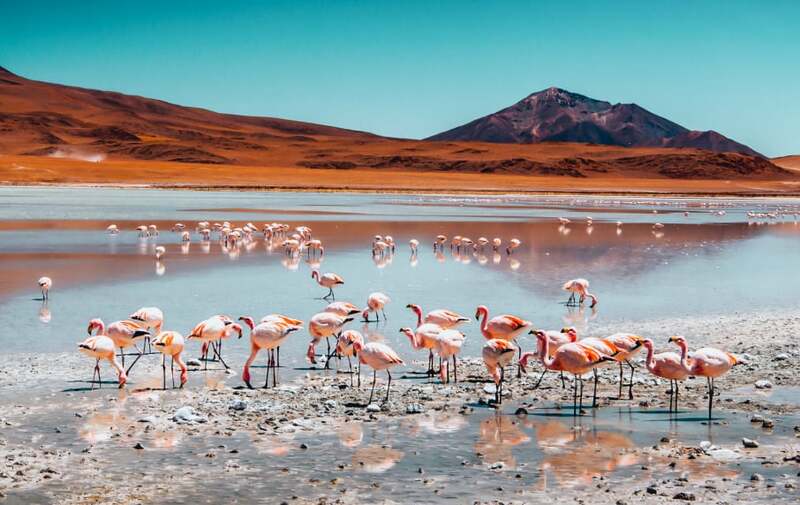 Salar de Uyuni is one of the harshest environments on the planet for vehicles, meaning that there can occasionally be unavoidable issues with the vehicles. The drivers of these cars are well experienced and used to breakdowns so if issues do arise there’s no need to panic. It is very rare that you are stuck for long as there are always other cars around that are willing to help each other out so sit back and enjoy some of the most beautiful surroundings this planet has to offer.